Want to exercise but don’t have time? Well for those who can’t find time to do it because of work there’s one smart solution. 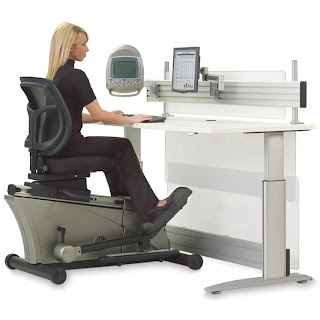 You can do it with the help of elliptical machine office desk with capabilities of letting you do multi-tasking jobs, really meant for workaholic like me lol! The adjustable-height desk is paired with a semi-recumbent elliptical trainer to enable the user to exercise while doing some work. You can see in the pic how she tends to maximize things as she works on the computer. Amazing isn’t it? With this one you can slowly pedal and be able to burn around 4K calories per week. The seat slides are richly padded and you can adjust the backrest for super comfort and convenience. With the press of a button you can adjust the height of the desk can be adjusted from 27” to 47” for switching purposes like from sitting to standing position. This equipment or furniture is so good that working seems not so stiff anymore.